SAILKARMA.COM - Sailing News, Videos and Photos! : Jaguar Cup Starts this Weekend in Miami! Etchells Sailors head back for the first of four weekends in the Jaguar Cup Series. Warm air, good breeze and great competition are beckoning Etchells sailors down to balmy Biscayne Bay once again for the 10th Annual Jaguar Series. With a forecast for a southerly 10-15 knots on Saturday and northerly 9-14 on Sunday the racing looks to be both pleasant and challenging. 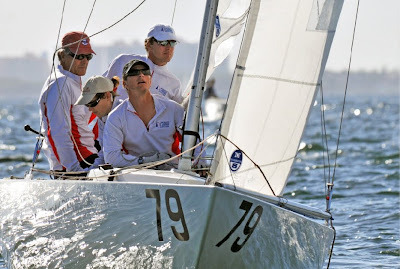 Bill Hardesty, amateurs Ante Razmilovic (GBR), Marvin Beckman, and Peter Duncan are among the elite group of 52 boats signed up to try to wrest the Jag Cup from Jud Smith and Dirk Kneulman’s sticky fingers. David Brennan, PRO, said yesterday if a slightly smaller number show up for this weekend’s Piana Cup, it’s likely the controversial windward gates will be scrapped, for the first time in several years. A last minute rounding decisions will likely be a welcome relief for the bowmen’s union.